Announcement During the years of 1979-1986, Boston, and the surrounding area, was a hotspot for the rock and punk music scene. I was fortunate to photograph some of those bands during their performances. They included Anthrax, The B-52s, Billy Idol, Bill Bruford, Cheap Trick, DYS, Howard DeVoto, Human Sexual Response, Ian Hunter, Jerry's Kids, Joan Jett, Lene Lovich, Mick Ronson, New Models, The Cars, The Jam, The Plastics, The Shirts, The Proletariat, Talking Heads, The Clash, Tom Petty, Bo Diddley, Bruce Springsteen, John McLaughlin, Robert Palmer, Tom Verlaine, X, and XTC. 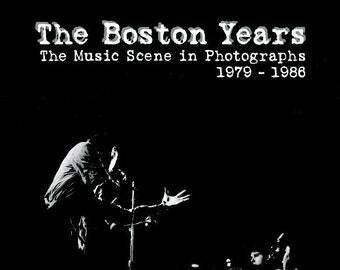 During the years of 1979-1986, Boston, and the surrounding area, was a hotspot for the rock and punk music scene. I was fortunate to photograph some of those bands during their performances. They included Anthrax, The B-52s, Billy Idol, Bill Bruford, Cheap Trick, DYS, Howard DeVoto, Human Sexual Response, Ian Hunter, Jerry's Kids, Joan Jett, Lene Lovich, Mick Ronson, New Models, The Cars, The Jam, The Plastics, The Shirts, The Proletariat, Talking Heads, The Clash, Tom Petty, Bo Diddley, Bruce Springsteen, John McLaughlin, Robert Palmer, Tom Verlaine, X, and XTC. Such a lovely image. Thank you so much! Each photograph is hand printed by myself using archival darkroom practices from the original negatives. All prints are signed by me. I only accept PayPal payments, no exceptions. I ship via UPS ground insured service to USA. If you are local and want to pick up I will refund shipping cost billed to you by Etsy. I will ship international but you must provide me with valid UPS or FEDEX account number and are responsible for all cost including any duty and taxes.